What does BIM stand for and how is it used in the construction process? BIM stands for Building Information Modeling, and at Omnibuild it is an important part of almost every step of the construction process. After a conceptual design is agreed upon, the next step is a detailed design. From that point on, BIM is front and center of the process. The model, which is built to visualize the detailed design, is developed with BIM software to provide the architect, engineers, and contractors a roadmap for the rest of the project. When did BIM come about – was it adopted quickly by the industry or is it still catching on? The original idea of BIM came about in 1962 from architect Douglas C. Englebart. In 1984, the first license of ArchiCad was officially released, and now it has been successfully integrated throughout the construction industry for more than 20 years. The software wasn’t adopted particularly quickly. However, over the last six years BIM has experienced a significant increase usage throughout in the construction industry. Are there types of projects that benefit more from BIM than others? All projects can benefit from BIM. The more complex the project, especially ones that require more coordination between entities (Mechanical, Electrical, Plumbing Coordination, Structural Calculations, Bid process Etc.) the more benefit BIM provides to the process. What does it take to learn and become certified in BIM? How many people at Omnibuild do this type of work? Deep experience in the construction field is a plus. However, dedication and a fair amount of patience in the training process, especially on programs such as Revit, are also needed. What is one example of a project in which you used BIM and how did it help? One that comes to mind is our 60 West 37th Street project, which is currently under construction. Utilizing BIM, we were able to facilitate the Mechanical, Electrical, Plumbing (MEP) coordination process. With the 3D model we were able to foresee MEP hits, and properly re-route or give different heights to avoid conflicts in the field during the installation process. What do you think the future holds for BIM and the industry? Will it become an industry standard? Do you think it can be improved? 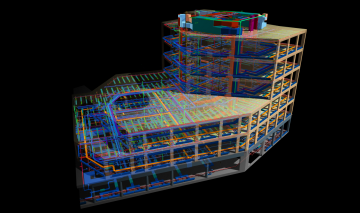 BIM is fundamentally redefining how architects, engineers and construction managers work today. It is the future for construction, and only will become more important as new technology is developed. For that reason, it is starting to become an industry standard. Now more than ever, when developers and owners look into general contractors to partner with, they make sure that the company’s staff has the needed expertise in BIM to move the project forward on time and on budget.